What Katy Actually Did: Unclaimed knitting in Lost & Found, is it yours?! Unclaimed knitting in Lost & Found, is it yours?! This is a fabulous story. One very kind lady on Ravelry.com has purchased this lost WIP from an unclaimed baggage warehouse in Alabama, USA. She is hoping that with some help she will be able to reunite it with the original owner/knitter. This is her original forum post: "I went to the unclaimed baggage place in Alabama today. 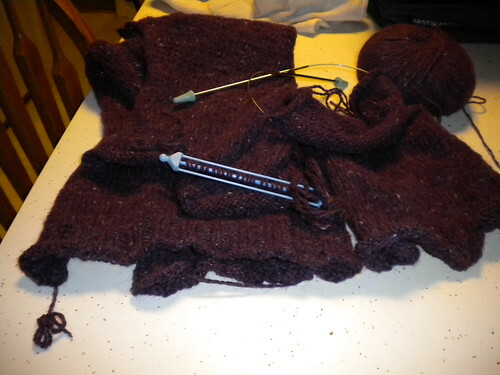 I found a ball of purple Rowan felted tweed, nice needles with green protectors, and the back and part of a sleeve done on a sweater. I am an incurable optimist, and I think someone had their knitting taken from them in security. I also wonder if that person is on Ravelry. If they were and saw this, it would make my year." Do you know anybody that was working on a project like this?! Yummy scones, thank you James Martin.